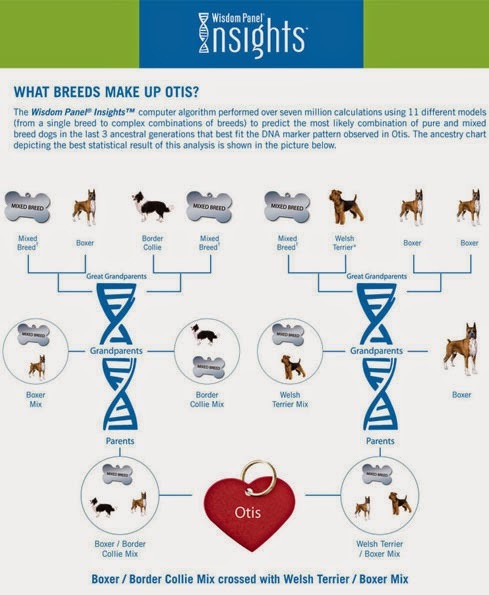 DOMESTIC DOG (Canis lupus familiaris) BREED DNA TEST?! If you’re of African descent and trying to learn about your personal origins, digging for family roots, breaking down a brick wall, connecting the dots of ancestors obliterated from the history records, or even searching for that elusive Native American ancestor, then Direct-to-Consumer genealogical DNA testing may provide a new vehicle of discovery for your journey. Genetic genealogy is a natural complement to traditional genealogy, and wonderful TV programs like "Finding Your Roots with Henry Louis Gates" is helping us understand how so inextricably the two are intertwined. If this is your inaugural foray into genetic genealogy, then the best places to take a DNA test depends on your interests and goals. Serious genealogists, adoptees, family seekers, ethnic admixture aficionados etc. should test at all of my recommended services to maximize your experience, and I encourage you to independently research each option on your own. (1) AncestryDNA; (2) 23andme.com; and (3) FamilyTreeDNA.com. Once you decide where to test, simply visit the company’s Web site and order the DNA kit. (a) EXPECTATIONS. Genealogical DNA tests may reveal things about your ancestry that are different from your perceptions about race, family, geopolitical boundaries, history, genetic connections, culture, and human migration so it’s imperative to keep an open mind. Your “looks” may not mirror your ethnic admixture results nor the ancestries of your genetic matches. Your showing of African admixture may not mean you “belong to” a specific African tribe represented on the test. However you may be able to connect with real genetic matches with roots presently from Africa (or any region), thereby leading you to potentially identify a specific tribe or sub-region from which your ancestors originated. Your genetic matches may also be essential to helping you understand your early family history and migratory paths. Of course, be prepared to deal with prejudice, racist attitudes, superiority complexes, and general disinterest. If you have an ubiquitous rumor of a Native American ancestor, your DNA results may instead reveal a REAL European (overwhelmingly so), South Asian or Southeast Asian ancestor. For Africans in the Americas, Asian DNA usually represents some sort of Malagasy, Filipino, Southern Chinese, Southeast Asia or Indian (South Asia) ancestry. If you’re a multi-ethnic African descended person (i.e. African-American, Afro-Latino), then DNA admixture tests can have difficulty interpreting your data. This is because African-descended genomes can be severally complex with diverse ancestral contributions and overlapping populations, and thus most algorithms can’t adequately identify, aggregate, and assign ethnic labels to the ancestry informative markers detected in your genome. Also, consider Africa has the most genetic diversity in the world, yet only a minute fraction of African populations have been sampled for use on most DNA test's reference panels. For the longest time, if you had African admixture it showed up as Yoruba or Mandenka. Further, ethnicity admixture tests only provide ESTIMATES of your AFFINITY (similarity) to reference populations chosen and labelled by each DNA company, so you’re at the mercy of each company’s interpretation of ethnicity. Also if your ACTUAL population of descent is NOT used as reference sample on the DNA test, then the computing algorithm will "fit" your ethnicity to the closest SIMILAR reference population(s) being used as a sample. More technically, at the 2014 International Genetic Genealogy Conference in Houston, chemist Doug McDonald stated in his presentation that the Affymetrix genotyping chip is only reliable microarray for adequately identify African ancestry, and to my knowledge most companies use some version of the Illumina microarray. Most reputable DNA companies analyze 400,000 to 700,000 ancestry informative markers (aka SNPs) out of a potential 15 million (the whole genome has 3 billion base pairs) so your results may not be as specific as you expect. Sometimes during an analysis of your DNA, there are no-calls, miscalls, deletions, insertions and imputed SNP values (chosen by an algorithm’s proprietary formula) — all of which may substantially affect your ethnic admixture scores. The good news is your DNA results will change as the science improves, more people test and additional reference populations are added; until then keep a proverbial grain of salt handy. EXPECTATIONS. Genealogical DNA tests can’t tell you a specific Native American tribe you belong to. Nor can you use these DNA tests as a basis for tribal enrollment. And even if you had a family member that was considered to be Native American, your DNA results may not reveal any evidence of it. Only Native American tribes or families can determine whether to accept you as one of them, even if you have no Native American DNA or a lot of it. What’s more, the Native American diaspora is poorly sampled/studied because many indigenous populations refuse to test, making it challenging for these analyses to adequately detect Native American DNA. Moreover, these ethnicity admixture tests only provide estimates of your affinity (similarity) to reference populations chosen and labelled by each company. As such, the ethnic percentages in your DNA results doesn’t literally mean you’re related or have any genealogical connection whatsoever to that ethnic population. Currently most companies analyze 400,000 to 700,000 ancestry informative markers (aka SNPs) out of a potential 15 million (the whole genome has 3 billion base pairs) so your results may not be as specific as you expect. Sometimes during analysis of your DNA, there are no-calls, miscalls, deletions and insertions that may further negatively affect your ethnic admixture scores. Also be sure to join the NATIVE AMERICAN ANCESTRY EXPLORER FB group to discuss your results, genealogy and stories [recommended by genetic genealogist Roberta Estes 2016 blog here]. The good news is your DNA results will change as the science improves; until then keep a proverbial grain of salt handy. First, AUTOSOMAL-DNA* (atDNA) Test analyzes your 23 chromosomes to estimate your ancestral contributions inherited from your parents, 4 grandparents, 8 great-grandparents,16 gg-grandparents, 32 ggg-grandparents, etc., going back 500 to 1000 years and includes an estimate of your ethnic admixture broken down into percentages, as well as matches to real genetic relatives. 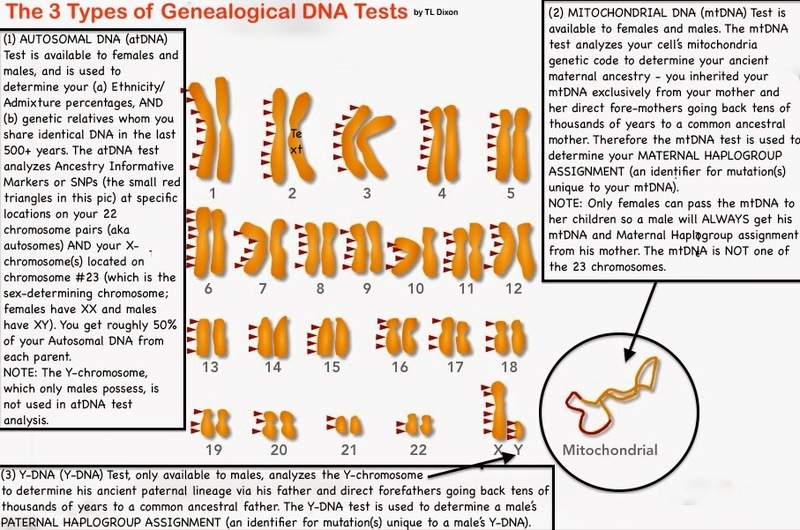 Second, MITOCHONDRIAL-DNA* (mtDNA) Test analyzes your cell’s mitochondria genetic code to determine your ancient maternal ancestry; you inherited your mtDNA exclusively from your mother and her direct fore-mothers going back tens of thousands of years to a common ancestral mother. Therefore the mtDNA test is used to determine your MATERNAL HAPLOGROUP ASSIGNMENT (an identifier for mutation(s) unique to your mtDNA). Some mtDNA haplogroups only originate in Native American populations i.e. A2, B2, C1, D1, X2a and subgroups C4c, D2, D3, and D4h3. Third, the Y-CHROMOSOME DNA* (Y-DNA) Test, only available to males, analyzes his Y-chromosome to determine his ancient paternal lineage via his father and direct forefathers going back tens of thousands of years to a common ancestral father. Therefore the Y-DNA test is used to determine a male’s PATERNAL HAPLOGROUP ASSIGNMENT (identifiers for mutations unique to a male’s Y-chromosome). Some of the Y-DNA haplogroups originate in Native American populations ie Q1a3a aka Q-M3. NOTE: If you have a confirmed mtDNA or Y-DNA haplogroup assignment originating in Native Americans, it means you affirmatively have a Native American ancestor existing somewhere in your past — even if you show zero percent (0.00%) on your atDNA ethnicity admixture results. (1) 23andme.com @ $99 (ancestry-only) and $199 (health & ancestry) + 10% discount per addn’l kit in same order in US (also available in Canada ($199); European Union (€169) with shipping address to Denmark, Finland, Ireland, Sweden, the Netherlands; and UK (€125) available with shipping address to England, Scotland, Wales), offers the best bang for your buck because it includes atDNA analysis, mtDNA & Y-DNA haplogroup estimates, and a test for Neanderthal DNA, all for one price. 23andMe's atDNA test includes Ancestry Composition (your ethnic breakdown) and DNA Relatives (your genetic matches). 23andme’s is my #1 recommendation because it's admixture tool Ancestry Composition is the most sensitive test on the market for detecting Native American DNA, often reliably reporting trace amounts (below 1%) and small segments that may NOT be statistical noise. 23andme's Ancestry Composition currently utilizes five Native reference samples: Maya, Pima, Karitiana, Surui, and Colombian. However some small admixture percentages related to Native American component might possibly be expressed as East Asian-Yakut, East Asian-Mongolian, and/or Oceania, probably reflecting shared ancestral populations with those clusters. In some instances I've observed admixture profiles of people with Native American DNA showing small amounts of amounts of East Asian at about 0.1%. Southeast Asian and South Asian in most instances represent some sort of Indonesian, Austronesian or Polynesian and is separate from Native American. With DNA Relatives, it is possible to meet genetic relatives from around the globe since the test is sold internationally. There are reportedly more than 1.2 million accounts in the database, and there is small possibility you could match with a Native American genetic relative [who also took the DNA test]. 23andme also offers such great genealogy tools as a Chromosome Browser (DNA segments you share with genetic relatives); Chromosome Painting (displays where your ethnic components are distributed on your chromosomes); Haplogroup Mutation Mapper, Family Traits comparisons, etc. If you test a child or parent, then a special feature, Splitview, will be enabled in the child’s profile to show the ethnic components each parent contributed to the child (this is called “phasing” where the parent’s genome is compared to child’s). As of May 1, 2015 23andme’s Family Tree utility has been integrated with myHeritage.com but this program has since stopped. Customer service rates fair because it's difficult to contact them by phone; your best bet is to open a request via 23andme's Web site. However CS does attempt to resolve your inquiries and issues. *NOTE: In October 2015 23andMe announced it got FDA's approval to offer some health interpretations [see NY Times article here]. This included a controversial new interface, community platform and site-wide overhaul that abolished some of the most beloved tools, as well as an unexpected price increase from $99 to $199 — all of which has been met with strong opposition by many customers with genetic genealogy interests. As of March 2016 many customers on the V3 chip or earlier versions are still on the old platform while new customers are on the new one. On May 26, 2016, 23andMe.com announced a new DNA Relatives In Common With (triangulation) feature for users on its new platform. *ADVANCED: 23andme is primarily a health data site, it has strict and controversial privacy policies, along with a cumbersome genetic relatives’ invite system and a 1000-cap on DNA Relatives. A percentage of 23andme customers are reportedly only interested in health results so connecting with DNA relatives can be notoriously difficult leading to protest by genealogy customers. 23andme’s proprietary algorithm for Ancestry Composition (using BEAGLE and Finch) ignores ethnic components in favor of more confident ones and imputes SNP values (using IMPUTE) so your results may not be as specific as you expect. With Ancestry Composition, 23andme alleges a 99% Precision rate, meaning if the DNA segment is labelled as "Native American" then it has a 99% chance of being Native American; and a 99% Recall rate, meaning that if there is Native American admixture it is almost guaranteed to be found and labelled as such. However you are able to view your admixture in modes of confidence for accuracy: conservative (90%), standard (75%) and speculative (50%), the latter offering the most specific, and uncertain, estimates of your ancestry. 23andme formerly offered interpretations of health data but the U.S. FDA issued an injunction against the company so health reports were estopped. However, your 23andme raw data still contains medically relevant SNP data. 23andme reduced the number of SNPs tested from 700,000 to 400,000 by changing the genotyping chip from V3 to V4 custom Illumina chip. Customers taking the 23andme test as of November 2013 are on the V4 chip so your data may not be compatible with some genealogy services, including FTDNA's new atDNA transfer program because of V4’s reduction in SNP locations. In June 2014 23andme opened a satellite service in Canada selling DNA kits for $199, which includes health and ancestry reports. As of September 21, 2016, 23andMe dropped split its product offering -- $99 for ancestry only (autosomal DNA, mt-DNA, Y-DNA and Neanderthal testing) or $199 (health & ancestry). 23andMe is a privately held personal genomics and biotechnology company based in Mountain View, California. The company was founded by Linda Avey, Paul Cusenza and Anne Wojcicki (CEO), who is married to Google co-founder Sergy Brind [source: Wiki]. When your 23andme results become available: you can download your 23andme raw data ZIP file and upload to Gedmatch.com, a free site offering genealogy tools; Promethease.com for a health analysis; transfer your 23andme test results to FamilyTreeDNA's new Autosomal Program here (small fees may apply); DNATribes’s SNP analysis ($39) @ http://www.dnatribes.com/snp.html, which includes ethnic admixture breakdown in a detailed "deep" ancestry report, as well as your mtDNA raw data ZIP file for James Lick's mt-haplogroup analysis @http://dna.jameslick.com/mthap/. (2) Ancestry.com offers only the atDNA test for $99 in US + applicable subscription fees or $49 access fee for DNA relatives (also available for purchase online for residents of the United Kingdom, Ireland, Australia, New Zealand, Canada @ £99 + international shipping fees, and 29 other countries), and is perfectly suited for beginners, traditional genealogists and hobbyists. 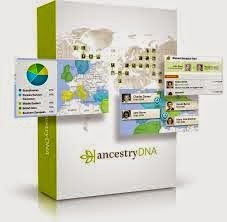 AncestryDNA's product includes admixture tool, Ethnicity Estimate, and a genetic relatives’ list, which is integrated with ancestry.com’s user-friendly Family Tree and new pedigree system. Of course be careful about trusting information in Family Trees (the "Indians" attached to the Family Tree may be erroneously placed there). You can also invite other AncestryDNA customers to view your ethnic admixture and genetic matches, a nifty tool. Combine this with billions of genealogical records, then AncestryDNA offers the best chance to connect with genetic relatives in the USA and break down brick walls, including those with Native American ancestry. However AncestryDNA's Ethnicity Estimate still needs tweaking and it’s rather conservative with detecting Native American ancestry. AncestryDNA utilizes 131 Native American reference samples but specific populations are unclear. Sometimes Native American-related admixture is thought to be [but not always] expressed as Asia East and Asia Central on this test. Interestingly I've observed people with Cherokee and other US Native ancestry reporting higher amounts Asia Central than Native American. I assume this might be the "North Amerindian" component in Native American in tribes from USA East, USA North, Canada, and Alaska Natives. Since most DNA companies (including AncestryDNA) use only reference samples from USA Southwest, Central America and South American to represent "Native American"on admixtures tests and these reference populations usually show less North Amerindian affinity (see DNA Tribes Digest article here), it is possible, customers with Amerindian heritage from more northern tribal sources might show closer affinity to Asia Central and Asia East (just a hunch). Of the recommendations, AncestryDNA seems more likely to have customers with no Native American admixture in their Ethnicity Estimate. However you can click on any of the admixture categories (even the ones with 0%) to see your RANGE SCORE [a drop-down box will open], which may reveal "real" percentages that are too small to show in your Average Score. One nifty tool is you can also invite other AncestryDNA customers to view your ethnic admixture and genetic matches. Further, ancestry.com’s vast Family Tree system includes shaky green-leaf hints to help you identify a possible common shared ancestral heritage, be but careful about trusting information in these trees because it may be erroneously placed there. Many customers also have incomplete, private or no family trees at all making genealogy research even more tedious. On May 12, 2016, AncestryDNA announced it would begin testing new customers on a new microarray chip that has more ancestry informative and some health markers. The new chip has 700,000 SNPs and will reportedly refine AncestryDNA's "ability to provide insight into your ethnic and geographic origins and your family’s genetic history." [See Ancestry blog here.] On April 2, 2015, AncestryDNA launched New Ancestor Discoveries (NADs), “a technical innovation that combines the latest in genetic science, new patent-pending algorithms, and access to AncestryDNA’s extensive database to push the boundaries of human genetics...," which are revealed "through a unique combination of AncestryDNA results and the millions of family trees shared by Ancestry members. First, living cousins of each AncestryDNA member are found and organized into family networks, called DNA Circles, which brings together a group of individuals who all have the same ancestor in their family trees and where each member shares DNA with at least one other individual in the circle." On July 1, 2015 AncestryDNA introduced new BETA overhaul “New Ancestry Site," which includes a new look, fonts and faster processing. According to AncestryDNA, your genealogy information from your family trees have been re-organized to tell a story about your family based on the information you stored for each family member in a new feature LifeStory, which will replace Story View feature soon [see announcement here]. AncestryHealth is another new BETA feature which gathers your health information to tie to your family tree and DNA information. (Note: Your “informed consent” and new log-in will be required to share this information with others). However AncestryHealth does not use your DNA (raw data) for this information and requires you to input your own family’s information using a family tree and summary format [see see article here]. Time will if these new offerings will be of value to customers and there is plenty debate about it. NOTE: An additional $49 a year fee is required for new DNA customers in order to access their DNA relatives list; not required for those with subscriptions), which has been met with criticism because this new fee was not advertised. However the sharpest criticism from the genetic genealogy community is AncestryDNA’s lack of genealogy tools (ie segment browser, chromosome painting, triangulation). AncestryDNA’s genetic kinship prediction system needs overhauling (2nd cousins can be predicted as 4th cousins). Customer service is fair, but responses can be canned; reps can be contacted by phone and Web site. When your AncestryDNA results become available: you can upload your raw data ZIP file to Gedmatch.com, a FREE site offering genealogy tools and Promethease.com for a health analysis.Transfer your AncestryDNA raw data to FamilyTreeDNA's new Autosomal Program here, and/or DNATribes’s SNP analysis ($39) @ http://www.dnatribes.com/snp.html, which includes ethnic admixture breakdown in a detailed "deep" ancestry report. 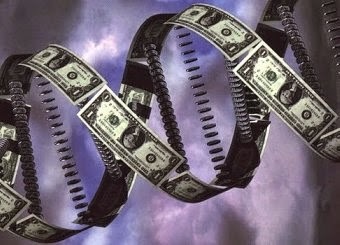 (3) FTDNA.com offers a range of DNA tests (priced separately): atDNA (aka Family Finder, $79); mtDNA (from $199); and Y-DNA (from $169). FTDNA is great for serious genetic genealogists, citizen scientists, and those interested in deep ancestry. 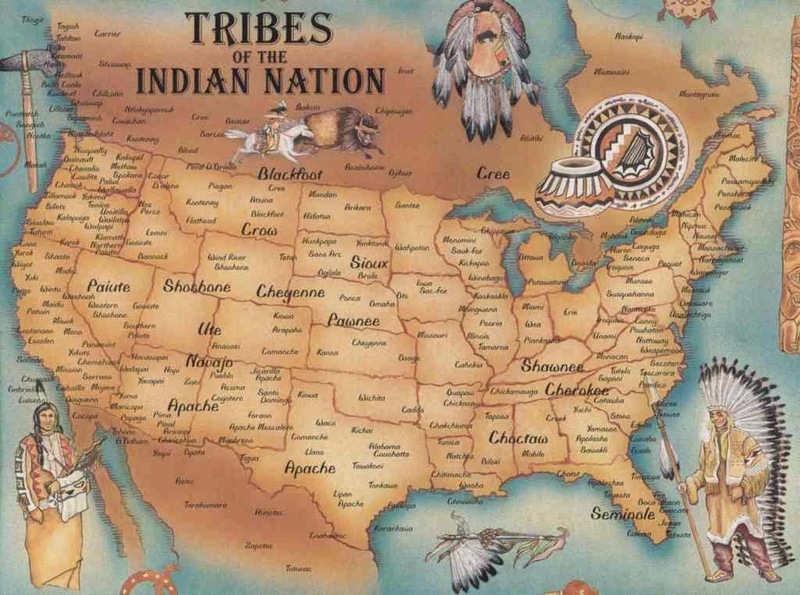 FTDNA is the only genetic testing service offering professional surname and geographical projects you can join or create (includes a discount on test prices), including Native American projects. FTDNA even tests for individual SNP's, including the 9-repeat allele, a marker on chromosome 9 that is found in all sampled Native American populations. Of my recommendations, Family Finder’s ethnic admixture product, myOrigins, is the most conservative analysis for detecting Native American ancestry. If your Native American percentage is below 1%, it will not get reported at all in myOrigins’ “New World” category. Reference population samples include: Karitiana and Surui. It is possible your Native American ancestry to be expressed as Northeast Asian, Central Asia, and Finnish/North Siberia but probably only when accompanied New World. FTDNA also offers genealogy tools for triangulating and segment browsing, but not a chromosome painting (displaying the ethnicity of your DNA segments). FTDNA Family Finder's genetic relatives application has strict DNA segment matching requirements — only people sharing cumulative 20cM+ will show as a match; compare this to 7cM industry-wide standard — so your genetic relative matches may be much lower than expected. FTDNA currently has a new atDNA Transfer Program for AncestryDNA and 23andMe V3 customers; raw data transfers are $39 or FREE if you recruit four others to transfer so expect your match numbers to improve. On May 25, 2016 FTDNA announced it was adjusting parameters to it's FamilyFinder matching thresholds, which restricted the number of genetic matches many customers (especially African-Americans). The upgrade has in some cases exponentially increased the number of matches for these customers as well as created more mitochondrial-DNA matches. As of February 16, 2017, FamilyTreeDNA released a new Autosomal Transfer Program for 23andMe and AncestryDNA customers with the capability to support myHeritage and National Genographic soon. 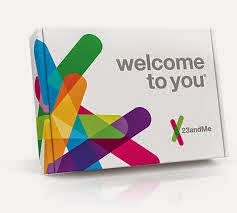 23andMe© V3 and AncestryDNA™ V1 now receive a full list of matches and the ability to use the Matrix feature FOR FREE. For only $19, the customer can unlock the Chromosome Browser, myOrigins, and ancientOrigins. 23andMe© V4 (after November 2013) and AncestryDNA™ V2 (after May 2016) receive all but the most speculative matches (6th to remote cousins), also for free. After transferring, if the customer wants to receive speculative matches, they will have to submit a sample and have a Family Finder run at the reduced price of $59. Additionally, all previously transferred files that have not been unlocked will receive their matches and have access to the Matrix feature for free as long as the release form is signed. These kits will be also be able to unlock the other Family Finder features for $19. Transfer your other test results to FamilyTreeDNA's new Autosomal Program here. Customer service is good, more personalized, and reps can be contacted by phone, email and social media. *ADVANCED: FTDNA probably has one of the widest array of mtDNA and Y-DNA products available in the market, including high-resolution analysis, comprehensive uniparental genetic marker values and genetic matches. FTDNA is one of few companies offering a Full Mitochondrial Sequence test ($199) and for Y-DNA (males only), you can choose a Y-DNA STR test (12 to 111 markers; from $169) or the BIG Y test ($595; high resolution analysis of the Y-chromosome testing thousands of markers). FTDNA's Family Finder algorithm utilizes ADMIXTURE, which scans your genome 10 times to help estimate your ethnic admixture percentages. FTDNA analyzes 700,000 atDNA SNPs locations but removes 3000 of the medically relevant ones. FTDNA’s combined atDNA, mtDNA and Y-DNA accounts are estimated at 701,953. Earlier 2014 FTDNA, in conjunction with the National Genographic Project, implemented an interpretation of the Y-DNA Phylogenetic tree but this has stirred some controversy due to user friendliness, nomenclature and compatibility with ISOGG’s Phylogenetic tree. FTDNA recently overhauled its Family Tree system, which is compatible with Gedcom files. You can also transfer your Nat Geno 2.0 (https://genographic.nationalgeographic.com/) results to FTDNA for free. FTDNA also upgraded its FamilyFinder matching thresholds. According to FTDNA, "... the amount of shared DNA required for two people to show as a match was a minimum of 20 total centiMorgans of shared DNA with a minimum longest block of at least 7.69 cM for 99% of testers, 5.5 cM for the other one percent. ... With the adjustment, if two people share a segment of 9 cM or more, they will show as a match regardless of the number of total shared cM. However, if there’s not a block that’s 9 cM or greater, the minimum of 20 shared cM with a longest block of 7.69 cM applies. "Family Tree DNA is a division of Gene by Gene, a commercial genetic testing company based in Houston, Texas. Family Tree DNA was founded based on an idea conceived by Bennett Greenspan, a lifelong entrepreneur and genealogy enthusiast, and co-founded with Max Blankfeld and Jim Warren. [Source: Wiki]. DNATribes’s SNP analysis ($39) @ http://www.dnatribes.com/snp.html, which includes ethnic admixture breakdown in a detailed "deep" ancestry report, as well as your mtDNA FASTA file for James Lick's mt-haplogroup analysis @http://dna.jameslick.com/mthap/.